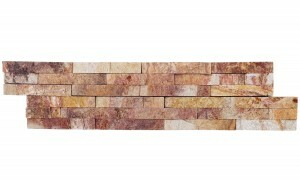 Autumn Meadow Ledger Panel tile is a Natural Stone Quartzite with brown tones. Seemingly random strips of tile are glued together to form a panel that is easy to install. Autumn Meadow Ledger Panel frost resistant tile is suitable for indoor or outdoor walls in residential and commercial installations.